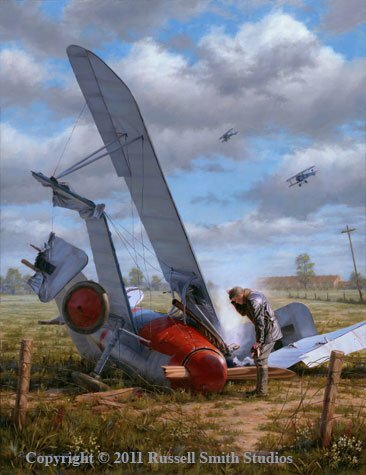 / Size 21" x 27"
This crash scene based on a photo of Paul Strähle's crashed Albatros DV 4594/17. Strähle flew this bird with both Jasta 18 and Jasta 57. He crashed it on May 16, 1918. As he was making his approach to the unit's airfield that day his engine cut out. Only 50 meters above the ground he was forced to aim for the closest field. Strähle wrote, "I flew towards a field filled with shell craters, trenches, wire barricades, telephone posts and other obstacles." He then continued, "Upon landing I struck the telephone wires and wire entanglements and I smashed my right wing. At the same time I hit a telephone pole on my left which I completely chopped down. With a loud crash my Albatros landed upside down and my head struck the top wing." Miraculously. Strähle walked away from the scene with only a slight bump on his head. This special edition of prints on canvas measure 21" x 27".